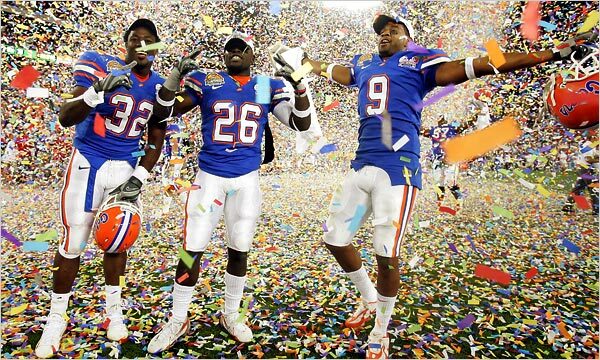 FLORIDA GATORS Do it Again!!! Starting to see a trend here! Florida beats Ohio State again for a NATIONAL CHAMPIONSHIP! They are now the only team to hold both the Football and Basketball Titles in a calendar year, AND academic year! Re: FLORIDA GATORS Do it Again!!! Wow...listening to the post game interviews, I think Ohio State should challenge the Gators to a spelling bee...that they would win. I will say this, there is no contest on which team is getting a better education and has the ability to communicate so the majority of Americans can understand what they are saying. Seems sticking around doesn't help the phonics, but does help with the defense of a championship. Way to go! And, this has to do with boating in what way???? Congrats and all but perhaps this is Bilge material. Seacraft.. because the guys were fired up and made grammatical errors, that makes OSU a better school?! Maybe they can take us in a poetry reading contest, but in sports, they're LOSERS. So do they use Yamaha power or Etec? GO GATORS ! ! ! WooooooooHooooooo ! ! ! ! I just had my better half wait in line at Gator Haven in St. Pete to get me some T-shirts. She just dropped them off at work for me, pretty nice of her and pretty nice T-shirts ! dont start to think that OSU and U of Fare not equals within academia. I will put the best students Florida has against OSU anyday. I am sure that OSU has had some dumbasses graditate let me see, Orlando Pace was no Rhodes Scholar, AJ HAwk was as country as Jeff Foxworthy (or at least his hair screamed hillbilly). Should I continue with the B-ball team or do you see my point? Give me a break. Noah sounded like a crip wanna-be and trust me, he had an easier life growing up than 99% of the players on each team, which includes his education at the finer schools as a kid... Congrats, yes.... just show something other than the "hood" to reppresent, yo. Donovan, first class guy...HE was even trying to stop the rambling idiot in post game interviews. Absolutely, Noah was definitley pseudo hip hoppin it in his post game "statement". I uderstand the emotion, but give me a break! Otherwise great game from a great team! UF is ranked highly above OSU in every academic aspect - check the ratings - not to mention UF has the 7th ranked Business Graduate School as of 2007. Lee Humphrey is quite smart though - top of the line student and athlete. And I'm sure Greg Oden is a mensa candidate compared to anyone on Florida's team. I thought I heard it said that Noah is from Ohio. Or at least one of the best Gators. At least they know where to go to find good players. Noah is the ugliest human being I have seen in quite a while. I do NOT understand the announcers man love for him. Well at least none of the players have been arrested for attemted murder. Gee I hoap al mie spellin be rite. Only 144 dyas until we begin the defense of our football title. (Sept 1st).